Acoustic Guitar Notes Ideas, tips, and news for all guitarists. For members of the trade. Acoustic Guitar Book Report News about the latest instruction books, CDs, and DVDs. Why luthiers are turning to alternatively sourced materials. Long before "going green" became a trend, luthiers were already great recyclers. Discarded mahogany church pews have produced many fine guitar necks. Red cedar and Port Orford cedar trees that have been killed by fires have yielded many high-grade guitar tops. Bay laurel driftwood logs salvaged from Oregon beaches have been milled to make stunning backs and sides, as have claro walnut trees removed in urban areas. Most of these woods are available in traditionally harvested form, so why go to the trouble of sourcing them alternatively? Are luthiers just trying to save money? The main reason for using recycled (previously processed for use other than guitars) or reclaimed (salvaged from the beach, forest floor, etc.) wood is that it can often be found in higher quality than in recently grown and cut logs. Much of this material has had many years of seasoning and may have lots of character, too—features that are found in the finest tonewoods. The fact that using these woods lowers the impact on the planet makes them even more attractive. Let's look at a few of the alternative ways that tonewood is being harvested and how guitar builders are using recycled wood in their instruments. Before the use of powered machinery (including Caterpillar tractors, "bull donkeys," and "steam donkeys"), Northern California's coastal redwood logs were floated down rivers to sawmills. Along the way, some logs sank to the bottom, where they remained in the river silt for 100 years or more—thus the term "sinker." During this time an interesting transformation occurred. You might think that the logs would rot in the water, but the majority did not. Water tends to preserve tight-grained, first-growth redwood, and some of these logs absorbed minerals from the silt at the river bottom, changing the natural redwood color to blue, purple, black, yellow, burgundy, and everything in between. A few have extraordinary striping running through the wood. Spurred by increasing prices for high-quality construction lumber, wetsuit-clad salvagers spent hundreds of hours searching for sinker logs on the cold river bottoms starting in the late 1980s. Using small "barges" made from two cylindrical pontoons connected by cross members with a winch in the middle, they began to remove the sinker logs from the murky river, with some of the wood ending up in the hands of luthiers. I've been creating guitar tops from a monstrous, 14-foot-long sinker redwood log I came across while visiting a local sawmill in December of 2000. The log has fine, consistent grain running its entire length, and a purple color on one side, fading to reddish golden brown on the other. I could immediately imagine the natural sunburst effect it would create on a book-matched soundboard. I initially hesitated to purchase the entire log, so I talked the sawyer into letting me buy a two-foot section (which still left him with a log that would yield 12-foot beams for building projects). Once I'd cut and cured the wood, built a couple of guitars, and gotten lots of "holy cow!" comments about the tone and looks, I went back to the mill and bought the rest of the log. I have since experimented with several different combinations of back-and-sides woods. Some of my favorites combined the redwood tops with salvaged rosewood back and sides, resulting in a guitar built primarily from salvaged woods. 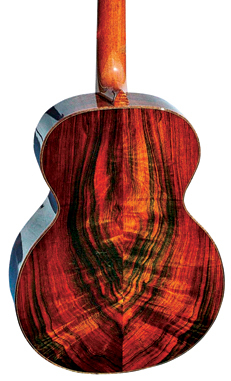 Companies such as R. Taylor, Breedlove, Ryan Guitars, and others have also constructed instruments with sinker redwood tops. Kevin Ryan likes redwood for top wood in general, whether it is sinker or not. "As a result of its high strength-to-weight ratio, it really shines at the upper registers like cedar, only a little darker," he says. 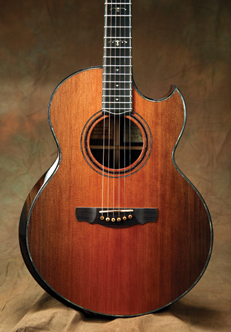 "It sounds great in big, open alternate tunings, and it has a lush sound that fingerstylists really love. The sinker has these lovely acoustic qualities but also happens to look fabulous—and of course the story behind it is very compelling." Simon Fay, a luthier in New Smyrna Beach, Florida, has made a number of guitars with sinker tops. "I have been able to get very good clarity but also a tremendous amount of overtones," he says, adding that it combines some of the best qualities of spruce and cedar. 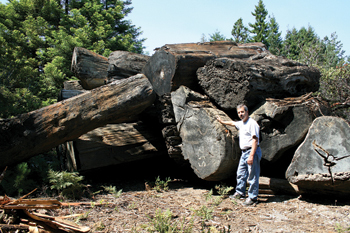 Unfortunately, the salvaging of sinker redwood came to a halt in the mid-1990s. There are still plenty of logs in the rivers, but salvaging regulations (set up in part to protect salmon) now make the cost of operations prohibitive. However, there is still a large amount of this amazing material around. We can only hope that future stream restoration projects will include the removal of the remaining logs that never really belonged there in the first place. But other ways of salvaging redwood continue. In my home county of Mendocino, California, some gigantic redwood trees called "buckskins" have been salvaged from the forest floor. These trees were felled over 100 years ago but were never gathered for one of two reasons: the fallers would sometimes get ahead of the gatherers, and there would not be enough trees in the area to make moving the rigging used to haul the logs out of the forest worthwhile; or the rigging simply wasn't big enough to handle some of the giants that were fallen. Since redwood is resistant to rot, many of these giants are in a "perfect" state of preservation, and some of this wood has found its way into the guitar-making world with great success. Brent Cole of Alaska Specialty Woods, located on Prince of Wales Island, Alaska, has taken tree conservancy to a very high plane. In the search for master-quality Sitka spruce tops, he disassembles discarded Sitka spruce log bridges and log floats as long as 100 feet, and even removes standing dead trees or trees that have blown down in storms. Most of the Sitka spruce he processes for 50,000 tops each year is from salvaged logs. Not only does this type of operation conserve our current tree population, it serves to clean the existing forests, removing potential dry fuel for forest fires. Dave Maize of Earth-Friendly Woods in Cave Junction, Oregon, is a luthier and supplier of woods. Red and Port Orford cedar (reclaimed from trees killed by fires), and Sitka and Engelmann spruce (from trees that fell in storms or were killed by bug infestation) are some of the materials that he uses and offers. Using the good parts of these trees yields excellent tops and stretches the supplies. For the backs and sides of guitars, Maize uses claro walnut milled from trees that were removed in urban areas and bay laurel driftwood logs. A widely publicized example of reclaiming wood involved Taylor's Liberty Tree project. When the last surviving Liberty Tree (a 400-year-old tulip poplar in Annapolis, Maryland) was irreparably damaged by Hurricane Floyd in 1999, the 90-foot-tall living landmark became a safety hazard, and it was cut down following a special ceremony. Taylor Guitars purchased enough of the salvaged Liberty Tree wood to make a limited-edition run of about 400 full-size guitars in 2002 and followed up with another 400 or so special-edition Baby Taylors. This year, the company began offering a line of electric guitars using some of the remaining wood. This article only touches on a few "green" guitar operations. Much more is certainly being done in the area of wood recycling. And it's quite possible that even more existing materials could be used in guitar construction. How much tonewood is sitting out there in stumps, barns, bridges, or underwater, just waiting to be turned into great guitars? You can be sure that a number of resourceful people will continue the hunt. Photo credits: Micheletti—courtesy Rick Micheletti. Ryan—courtesy of Ryan Guitars. Yes! Please send me my trial subscription issue of Acoustic Guitar, the player's #1 resource for reviews, technique tips, sheet music, and much more. I'll pay just $24.95, and receive 8 issues of Acoustic Guitar. That's a savings of $22.97 off the newsstand price! In addition, you will receive 24/7 access to our exclusive web content. We are so sure you will be satisfied with your subscription, we are willing to offer a 100% money back guarantee! FREE LESSONS!Pay now and get 15 free acoustic guitar lesson downloads! Click here. © 2009 String Letter Publishing, Inc., David A. Lusterman, Publisher.